^ Bauder, Don. "Tiny Potrero Battles County and Blackwater USA". San Diego Reader. Retrieved on 2007-10-07. ^ "Blackwater Plans for New Military Facility Near San Diego Draws Fire From Residents, Peace Activists and Local Congressmember". Democracy Now!. 2007-04-19. Retrieved on 2007-10-07. ^ Kahn, Carrie. "Blackwater's San Diego-Area Plan Spurs Protest". National Public Radio (2007-10-09). Retrieved on 2007-10-15. ^ Four Civilians Worked for N.C. Security Firm, Associated Press, March 31, 2004. ^ Ken Silverstein, "Revolving Door to Blackwater Causes Alarm at CIA," Harper's Magazine, September 12, 2006. ^ "Blackwaters Top Brass". The Virginian-Pilot. July 24, 2006. ^ ニューズウィーク, "The Man Behind Blackwater", 22 October 2007, pp 36-38. 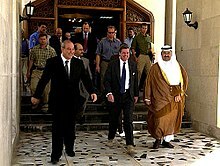 ^ "Role of security companies likely to become more visible"
^ US-IRAQ: Blackwater Blues for Dead Contractors' Families, by Bill Berkowitz, IPS, June 29, 2007. ^ "Agreement for security services". United States House of Representatives. March 12, 2004.